A must for mountain lovers, whether you prefer to climb them by foot or by bike. We flew to Nepal and actually spent most of our time off the bikes there. We cycled to few a villages/towns around the Kathmandu Valley, before cycling the Annapurna Circuit. Kathmandu Valley: Kathmandu > Patan > Bhaktapur > Nagarkot > Bhaktapur > Shivapuri > Kathmandu. Note: there’s a $15 per person entry fee to stay in the old city of Bhaktapur. That was way beyond our budget, so we stayed outside the old city at Radhika’s Homestay. She is an absolute cracker-jack. We loved her so much, we popped back in on the way past from Nagarkot. For more information on cycling the Annapurna Circuit, read our blog post here. August / September / October / November 2018 (August is off-season). Hot and humid in the cities. Cold in the mountains – our waters froze at 5,000 m.
All the hiking we got to do. We hiked around 117 km over the 3 months. Staying at Shivapuri Heights Cottage (for a fraction of the price). Dal bhat is life. This is arguably Nepal’s main dish. On a giant metal plate, you get rice, dal, curries and some side – and it’s refillable (below). Well, you usually just get more rice and dal. Since eating out was so cheap and easy, the only thing we used our stove for here was brewing coffees and heating up paratha. We bought all of our water. We only had the MSR TrailShot Pocket-Sized Filter at the time, so filtering water was a tedious task. We usually bought cases of twelve as you could barter a good discount. There are some good coffee shops in Kathmandu. Most coffee will be instant though, hence us brewing our own. You can find ground coffee in tea shops in the touristy parts of Kathmandu and Pokhara. We bought large (450 g) Primus gas canisters for around £12. They were everywhere in Kathmandu, a little less so in Pokhara. They lasted a while as we were only using it for coffee. You can grab a bargain on accommodation in the larger cities if you pre-book. We booked everything on booking.com. Every hotel bar two let us keep the bikes in the room. We never camped in Nepal. There was a generous hard shoulder on most big roads. There were some highways that we read weren’t suitable for cycling, like the main road between Kathmandu and Pokhara. Pikes on Bikes have devised a much nicer route between Nepal’s two main cities, find it here. 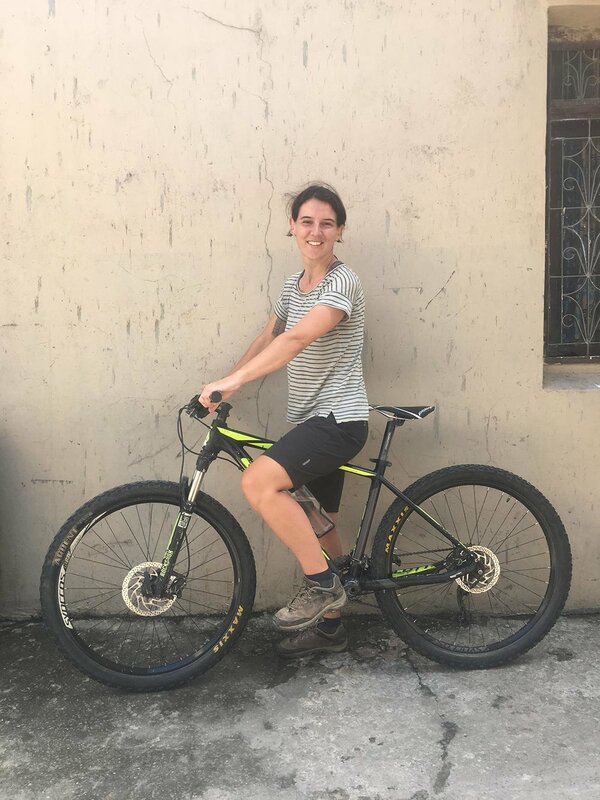 Nepal Mountain Biking (Pokhara) – When Jen’s wheel rim cracked, we rented her a Scott mountain bike from these guys, so we could still complete the Annapurna Circuit, while we waited for a new wheel from the UK. They also lent us some tools. Buses are super easy to organise, although we worried for our bikes every time they were strapped to the roof. We ended up buying some climbing rope, so we knew we could secure them down properly. We would also try to find some cardboard/polystyrene to pad them out. Tourist buses – huge coaches with crazy drivers. Yes, the bikes were still on the roof of a coach. Public buses – cheaper, smaller, rougher, with crazy drivers. Make sure you tie your bike down. We got a 90 day tourist visa on arrival at Kathmandu Airport for $100. There are shorter options available. The ATMs and card machines at the airport didn’t work, which caused us a big problem. Long story short, we had to leave our passport at the airport for the evening while we went into Kathmandu. The next day we had to go back with cash (dollars), buy the visa and collect our passport. So if you can, take dollars with you for the visa. We went with Ncell as they had the best coverage and rates. Do not buy the SIM card in Thamel, Kathmandu – we saw our plan for 5x what we paid. We found the data plan we wanted on the Ncell website, then walked to an Ncell dealer outside the tourist area and got it for the exact price stated on the website. You’ll need your passport. We had two new wheels couriered from the UK. We stayed at a lovely hotel in Pokhara that agreed to accept the wheels while we were riding in the Himalayas. Unfortunately, the wheels got stuck in customs, so in the end, we had to collect them in person from Kathmandu airport. Nightmare. But in theory, the postal plan would have worked. Bikepacking the Annapurna – Insightful article on cycling the Annapurna Circuit. Weeks Twenty-Eight to Thirty: Annapurna by Bike – Our blog post on cycling the Annapurna Circuit (in case you missed it above). Pokhara to Kathmandu – Cycle route that avoids the highway (in case you missed it above). Ncell – Link to current SIM packages and prices. Don’t stay in Kathmandu too long. It’s a big dustbowl with not much to offer once you’ve visited the main sights. When you are in Kathmandu, you have to go to the restaurant Western Tandoori. It’s simply delicious – and ridiculously cheap. We ate there 15+ times (we spent far too long in Kathmandu…). We found out the hard way that Nepal has high import tax rates. If you’re getting something new sent from your home country (like wheels), suss out a way of avoid the VAT. Maybe send it as a gift, or warranty part? You don’t need a guide for the Everest Base Camp trek or Annapurna Circuit, they are both clearly sign posted and easy to follow. 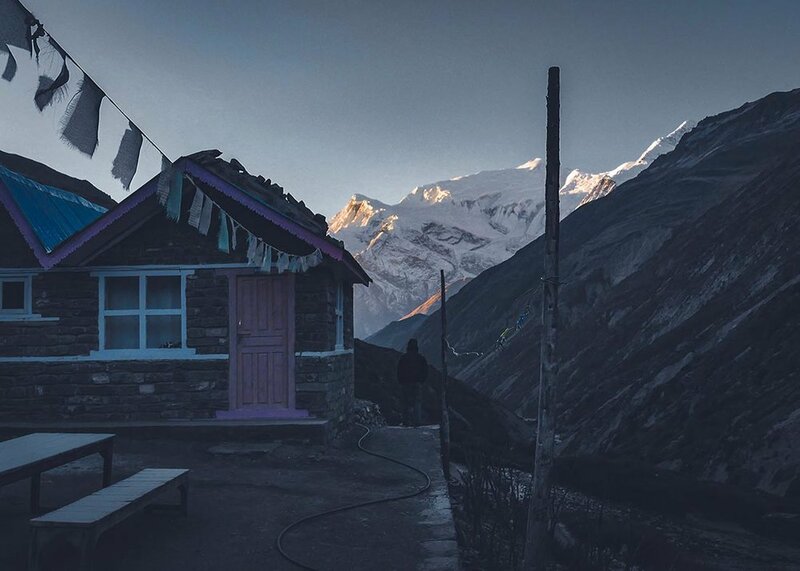 There’s also plenty of accommodation and restaurant options along the way, particularly on Annapurna. You just need to be mindful of your elevation gain each day after 2,500 m. Going it alone will save you $1,000s. If you do take a guided tour, particularly on the Everest Base Camp trek, read up on the ‘helicopter scam’. It’s rife and will ruin your trek.